Do you struggle when writing your mystery shop reports? Does it take much longer than you think it should to complete a report? Do you often get questions about your reports from editors, or even have your reports rejected? I have just released a new DVD that can help. It is 71 minutes of great ideas and tips to help you write better reports in less time. When you write better reports, you can qualify for more and better mystery shopper jobs. And when you write faster, you get more done in less time so your hourly rate goes up. Three things you should NEVER do in your reports. The best way to add more details to your reports. How five minutes now can save you lots of time later. The four words that will make your reports better, every time. Plus, get answers to your questions about mystery shopper reports. I have personally trained more than 10,000 mystery shoppers, and I can help you become a mystery shopper or become a better mystery shopper. Order your copy of Writing Great Mystery Shop Reports for just $29 now! SPECIAL OFFER! 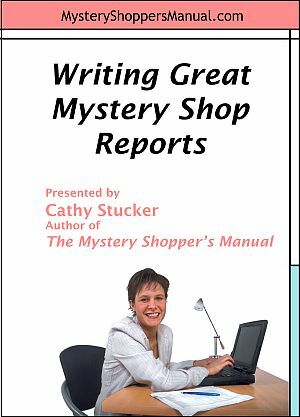 Save $9 when you order both Writing Great Mystery Shop Reports and The Mystery Shopper’s Manual (7th Edition)! Just $44.95! We accept PayPal, as well as MasterCard, Visa and Discover through our secure shopping cart.